I realised recently just how many of these sheet masks I had accumulated in my random sample drawer. I figured it was a good idea to finally put some to the test so it has been two weeks of heavy duty pampering. I sure do suffer for my blogging craft. This mask claims to moisturise, re-plump, tighten pores and reduce dark spots to improve skin vibrancy. At first I had a little bit of trouble putting this one on because it didn't fit to the contours of my face perfectly but I was able to maneuver it in to place. This one is also one of the pricier options at $7.67 per mask but Nuxe is a beautiful luxury brand with more expensive ingredients. The instructions say to leave it on for 10 mins but I usually like to leave my moisturising mask on for longer. After about 30 mins I removed it and massaged the excess product into my face instead of rinsing, as per the instructions. I did quite like this one and found it to be quite brightening and moisturising though I didn't notice and pore tightening. I also think you would need to use this as part of a full skincare routine with similar products to really see any reduction in dark spots though. I have tried the Hydro Boost moisturisers and cleanser so I was really keen to try this one. I was surprised by how much better this one seems to fit my face. Again, I left this one on for twice the recommended 15 mins to really get optimal moisturisation. I really noticed a big improvement in the moisture levels of my skin with this one and my skin texture did look more refined. This is defintiely one of my favourites and it is really cost effective as well at $4 per mask. I have no idea why this one is names after explosives but here we are. This one is the priciest of the bunch at $7.80. I really liked the coconut scent of this one and while I did notice an increase in my skin's moisture levels, I think the Neutrogena one still might beat it at a much lower price. This mask did give me quite a good fit though which was more comfortable than the others. It certainly wasn't a bad mask but compared to the others, you may want to pick up one of those instead. You can buy these singly for $10, in pack of 5 for $35 ($7 each) and a pack of 10 for $59 ($5.90). Out of all of these sheet masks, this one was definitely my favourite and the most unique. Instead of being a cloth sheet, it had an unusual gel consistency which meant it conformed and stuck to the contours of my face way better making it much more comfortable. This was the only one out of all four that I could actually still move around in without worrying it was going to fall off. The Tefiel Hydromask has 4 key ingredients; hyaluronic acid, aloe vera extract, Dipalmitoyl Hydroxyproline (boosts collagen, inhibits elasticity breakdown and free radicals) and Vitamin E. It gave great hydration and my skin felt smoother and softer straight after I took it off. To top it off, this mask also has a gorgeous black lace pattern while the rest are just plain white. At the end of the day I probably prefer a normal mask liquid because they are slightly more comfortable and I can usually just go about my evening and keep them on for even an hour or two (only ever do this with hydrating masks though!). For something different though, these sheet masks are great and I really liked how hydrating they were. 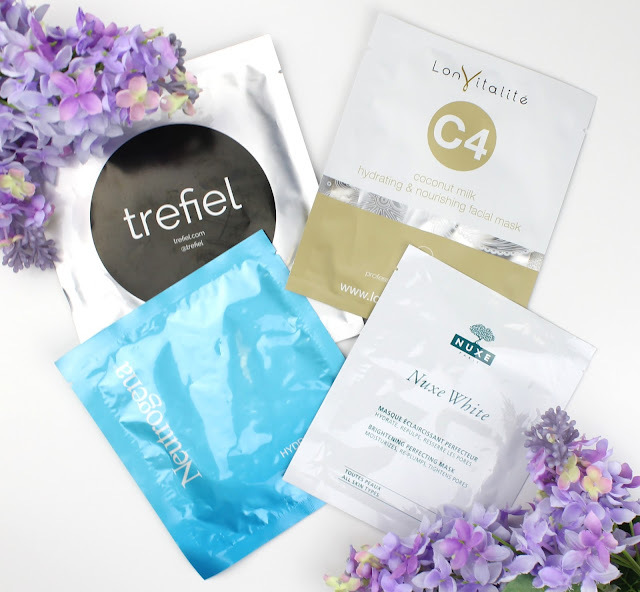 My absolute favourite of the bunch is definitely the Trefiel mask but the Neutrogena ones are also great for the price. Will you be picking up a sheet mask or two? Are there other amazing ones out there that I simply have to try? Let me know in the comments below. 8 comments on "Battle of the Sheet Masks"
I love sheet masks, but haven't treated myself to one in ages! I really enjoyed the Hydraluron sheet masks by Indeed Labs that are available from Priceline, they are awesome. I liked the Treifel one as well, but didn't feel like it did anything that amazing for my skin. I prefer a traditional mask over sheet ones as well! I only usually use sheet masks if I'm napping or in the bath because I don't need to move! Great comparison post.